Floor patterns can visually elongate wide rooms, expand narrow rooms, and mask a room’s defects. If you choose the right floor pattern for the room, you can achieve a lot with the simple configuration of tiles. A great material to use for flooring is ceramic tile. Not only does it offer health benefits, but it also allows for at least seven different patterns to improve any room in your home. Ceramic tile allows you to accomplish flooring feats that other flooring options simply cannot offer. The simple fact that there are seven floor patterns available with the use of ceramic tile (and that’s not all of them) in this post. This pattern is a straight-lay. The tiles are installed in a traditional grid, each edge parallel with the walls in the room. You can use any color, style, or design with this pattern to improve the room. Choose an elaborate design to show more personality, or choose a monochromatic color to keep things simple and modern. Similar to the tradition grid pattern, the diagonal grid pattern has the floor tile installed at a 45 degree angle from parallel with the walls in the room. Most homeowners call this the “diamond” pattern, since the squares are rotated to the point of looking like repeating diamond shapes across the floor. This pattern helps open up smaller rooms, and it can make wide rooms look fuller. Do you have a crooked wall? What about a wall-design pattern you need to break up with your floor tile? The running-bond tile pattern allows to hide room imperfections and draw the eyes from less desirable visuals in the room. This pattern has between a 35 and 45 percent offset with each row of tile, which is typically called “brickwork” or “staggered.” This pattern is great to use to direct traffic through a room. Near to the traditional grid pattern, the checkerboard tile pattern offers a unique color combination, usually involving a primary color and white. The pattern is timeless and brings together an entire room that needs a little extra pop. You can go with black and white, blue and white, or red and white to utilize a more classic look. Finally, you can finish the colors differently to get a matte and gloss finish. Otherwise known as the Chevron tile pattern, this layout evokes a sense of pride and boldness. The angular visuals is a beautiful choice for elongating a wide room or widening long spaces. You can use this tile pattern to guide the eye toward a focal point or direct traffic in a specific direction. The herringbone and the chevron tile patterns may look similar, and that’s because they are. The herringbone, however, does not have angled ends, which means each row is offset the width of the shape. Your chevron pattern is angled at the end, which means the zigzag is continuous. For the herringbone pattern, the zigzag is not continuous. The V-shape of the herringbone can be used to elongate a wide room. In most cases, the abundance of grout lines can be overwhelming in large rooms. It’s best to use this tile pattern in medium to small sized rooms. As the name states, this ceramic floor tile pattern offers a unique visual experience. Popular since before the Victorian era. The dot and octagon is frequently used in large rooms — the dot and octagon scaled to fit the size of the room, in some cases. Similar to the checkerboard floor tile pattern, this pattern can be colored to complement or contrast certain room design elements. After 25-plus years of serving San Fernando, Thousand Oaks, and Los Angeles, Transworld Tile is the leading tile showroom in the industry. You will find what you’re looking for with us, or we will order it for you. 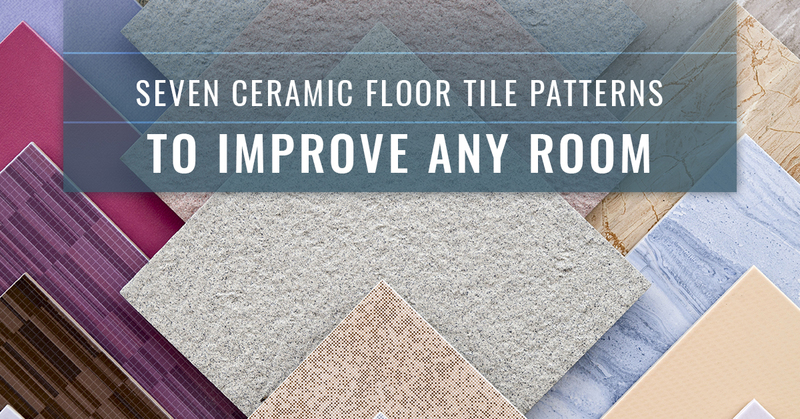 Are you ready to install new floor tile in your home? Give us a call or stop by our showroom today!